Cartonnage is a lovely handmade art, originated in France long time ago and it has been revived around the world in the latest years. It is the art of box making, out of cardboard, glue and fabric or paper. With this technique, we can make much more than boxes, unique functional ... read full description below. Cartonnage is a lovely handmade art, originated in France long time ago and it has been revived around the world in the latest years. It is the art of box making, out of cardboard, glue and fabric or paper. With this technique, we can make much more than boxes, unique functional pieces to decorate our homes, for everyday use or as unique gifts. 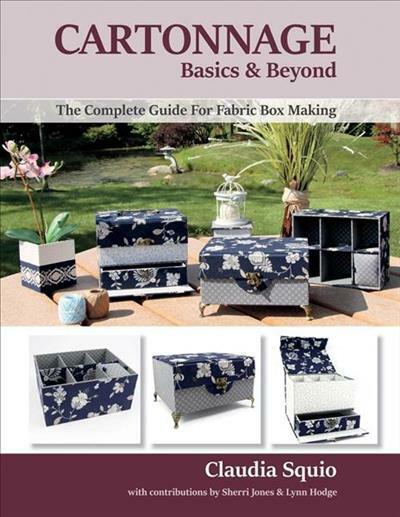 With step by step color picture Cartonnage instructions (about 700 pictures), no steps missing, this book is a master class to make your own beautiful fabric boxes from the very beginning. Also covers how to build more advanced pieces including dividers, trays and drawers. You will learn how to start from the scratch cutting your own cardboard or you will be able to start from some DIY kits (sold separately) with all pieces of paperboard pre cut and have fun using your favorite fabrics. Very simple materials needed, no expensive tools! You will also have the opportunity to learn how to personalize your boxes painting your own fabric or adding embroideries! Online videos available for this book. Claudia Squio is a Brazilian fiber artist living in Michigan and focusing on fabric cartonnage, that is a traditional art of making boxes covered with fabric or paper. She designs fabric boxes and cases and has been teaching this technique at quilt stores and quilt quilds and also through her online cartonnage school. She has authored the book Cartonnage Basics & Beyond - The complete guide to make fabric boxes and a Lecture Cartonnage - the art of box making. Some of her artwork also includes the preparation of the fabric, painting and sewing, combining techniques to make even more unique pieces. Besides creating the pieces and teaching she developed some DIY kits and tools that can be used for her students to start and facilitate the process of fabric box making.